Facebook recently launched App Center, the social network's take on an app store offering a centralized place to find more than 600 Facebook and Facebook-related apps. 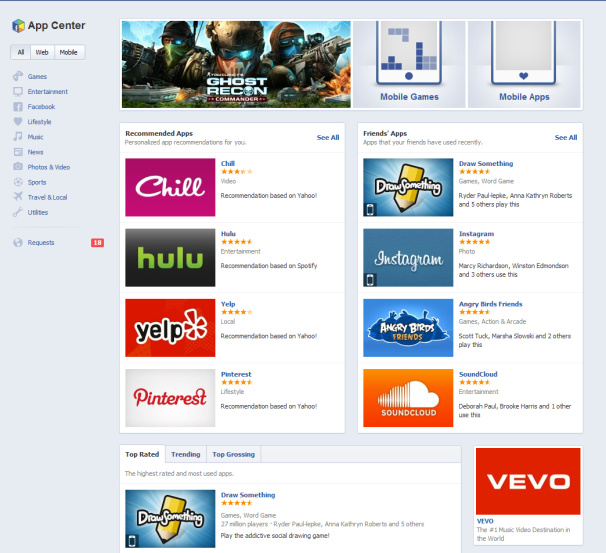 Think of App Center as one part showcase for mobile apps and third-party sites that use Facebook logins, and one part discovery hub for games and other features you can use inside Facebook.com. You can, for example, find apps for Android and iPhone devices that require or offer Facebook logins and have an alert sent directly to your mobile device to install the app. 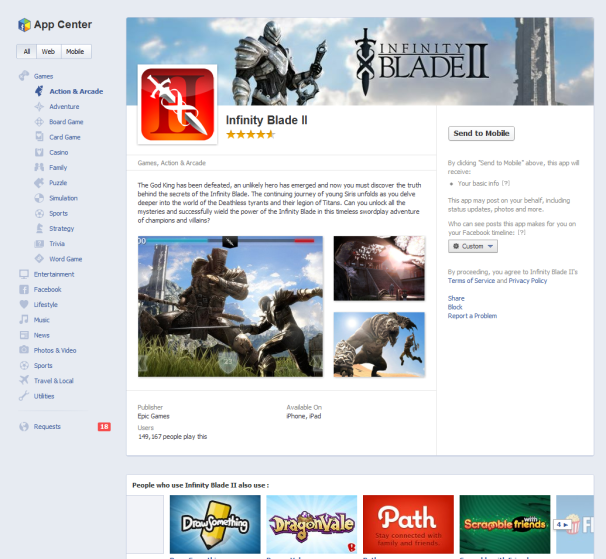 You can also use App Center to find games to play on Facebook.com, or apps to display on your Timeline. App Center also includes a section to easily accept or block all your game and app requests. App Center is not meant to be a replacement for the App Store or Google Play, but a funnel to access apps you'd like to use. Good luck finding apps though, as App Center lacks a basic search function. That said, App Center may be able to surface some good content for you since Facebook knows so much about your preferences and can share with you which apps your friends are using (more on that later). For now, however, don't expect App Center to replace browsing around the App Store or Google Play. That raises another question: if App Center isn't a replacement for other app stores, Facebook's ultimate goal for App Center is anybody's guess. Could this be yet another piece in Facebook's mobile strategy that some critics say will culminate in a Facebook smartphone? The company already has key components for its own handset such as camera and messaging mobile apps. 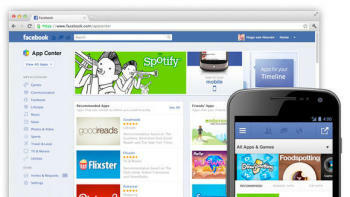 An app store would also be an important addition to any smartphone platform. Perhaps the App Center is just a tool to help you find more things to do with Facebook to keep you connected to the social network, a concept that would be sure to please the company's new investors. Or perhaps App Center and its app approval process will eventually replace Facebook's current wild west approach to apps that has bred many malicious apps on Facebook.com. Or Maybe Facebook's goals include all of the above. Like I said, it's anybody's guess. App Center is available on your desktop as well as mobile devices. Here's a quick look at the desktop version of App Center. When you land on the App Center, you see some of the usual things you’d expect on any app store: banner placement for featured apps, a list of apps recommended for you, as well as top rated, trending, and top grossing apps. There are also lists of apps your friends are using that tells you how many of your friends are using a particular app and even who they are. Some people may find that creepy, but it is handy if you’re looking for a Words with Friends opponent or someone you can trade labor with in Farmville. The App Center landing page also offers three main ways to view apps in the left column of the lading page: all apps, only Web apps, or only mobile apps. Below that App Center organizes the app catalog into ten main categories: Games, Entertainment, Facebook, Lifestyle, Music, News, “Photos & Videos,” Sports, “Travel & Local,” and Utilities. You can also find an entire section devoted to Timelineapps, which are basically apps that can post to your profile page and can be featured in the right-hand tiles under your cover photo. Most of App Center's categories are self explanatory, but two that might be confusing are Facebook and Utilities. Facebook is just a listing of all the Facebook-branded apps that are available such as Facebook for iPhone or Android, Facebook Camera, Facebook Messenger for Windows and so on. Utilities acts as App Center's miscellaneous section, including productivity apps such as SmartSync for iPhone which integrates photos and other information from Facebook into your contacts. Utilities also includes so-called communications apps such as Path, TinyChat, eBuddy, as well as Quora, Family Tree, and Match.com. Below the categories in the left column is a “Requests” link listing all the various game requests and offers friends have sent you. Personally, I think this is the best part of App Center since it offers me a quick and easy way to block apps that annoy me such as two recent friend favorites Bubble Safari and Lucky Slots. To block an app just hover over the invite you want to block and click the “x” that appears. 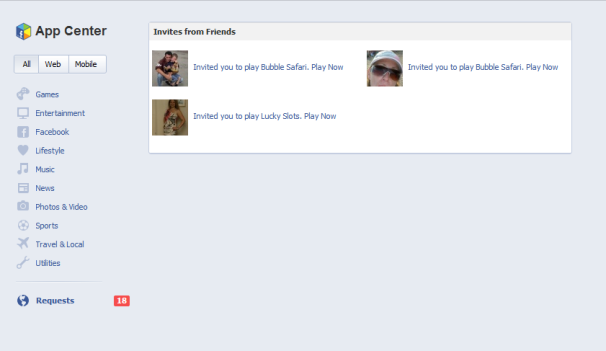 Facebook will then ask you if you want to block the app, block your friend’s game invitations altogether, or ignore the invite. Once you find an app you like, clicking on it sends you to a details page with information about the app. To the right, underneath the cover photo, you’ll see action buttons to access the app. If the app is available exclusively for mobile devices such as Infinity Blade II you'll see a “Send to Mobile” button. If it’s a Website like Hulu, you’ll see a “Visit Website” button, and if it’s Facebook app such as Social Empires or WSJ Social you’ll see a “Play Game” or “Go to App” button. Underneath the action button you can find important privacy information about the app such as what profile information it wants to access, whether the app can post to Facebook on your behalf, and your Timeline privacy settings. The main part of the app details page is taken up by screenshots and other information about the app. Below that you will find important statistics such as how many users the app has, and which platforms the app is available on (iPhone, iPad, Android, Facebook.com, and Web). App Center also makes it a little bit easier to get mobile apps onto your iPhone, iPad, or Android device. Let's say you want to play Infinity Blade II on your iPad. 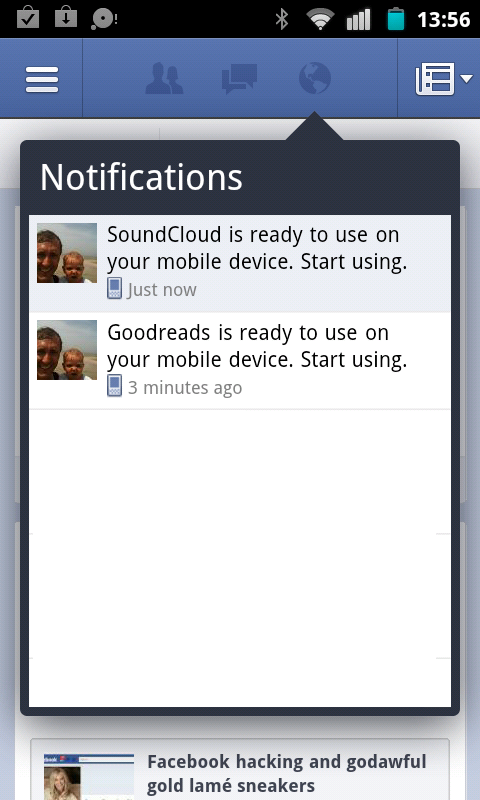 Clicking the “Send to Mobile” button will send an alert to Facebook for iPad. Once you tap the alert, the iPad will switch to the App Store for iOS where you can download the game. Facebook's App Center is a little bit clunkier than Google Play, which can automatically install an app on your phone by clicking one button through the desktop Web interface. But App Center's send to mobile feature can come in handy if you happen to find something on App Center that you’d like to use. App Center is available now to U.S. users and will roll out to other countries in the coming weeks.